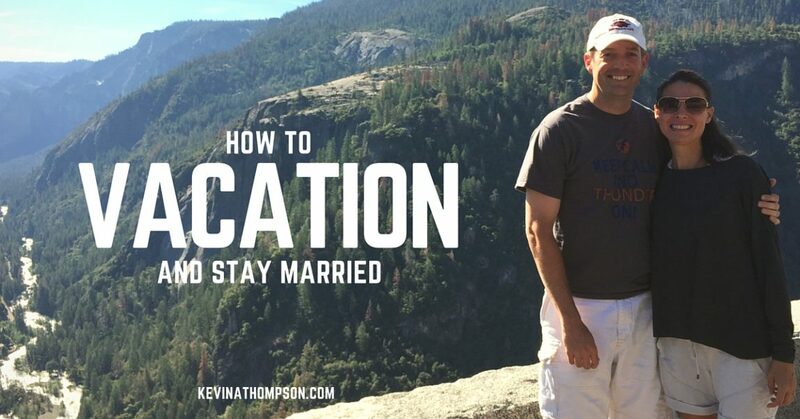 Few things can breathe life into a marriage (or family) more than a vacation. By breaking away from the daily demands, routines, and stresses, a couple can re-engage with each other. They can remember why they fell in love, be encouraged to stay in love, and dream of what is to come. Outside of marriage, a family vacation can greatly reconnect parents and children. Beyond the normal family tensions–bed times, homework, chores, etc–moms and dads can connect with the kids, have fun, and spend a greater amount of time together. For vacation to be successful, it requires some work. Too many couples simply go on vacation without ever talking through the important issues. With differing expectations and uncommunicated assumptions, couples can go on a vacation with high hopes only to experience great disappointment. Many couples experience their greatest fights while on vacation. These fights are evidence that they have not properly thought through or communicated about important issues. Before you go on vacation, every couple needs to talk through at least seven issues. Even if you have vacationed before, it’s always good to go back through these issues before every trip. 1. Activity. For some, vacation is a time of total relaxation and very little expectation. For others, a good vacation is characterized by constant activity. Neither is right or wrong, but both are extremely different. Which do you prefer? If there are differing expectations between spouses, what is a good compromise? 2. Friends or no friends. It takes a special relationship to vacation with other people. Just because you’re friends doesn’t mean you will do well together on a trip. Vacation friends have to share much in common. The first question is whether or not both spouses even want friends to go on the trip–sometimes it can be fun, but sometimes it’s better to be alone. Secondly, spouses have to agree whom to invite. Then everyone needs to agree how much time they will spend together, apart, etc. 3. Kids or no kids. Just like friends, a decision has to be made of whether to take kids with you. Unlike friends, you don’t get to choose which kids get to go–you have to take your own. Jenny and I try to do one vacation a year without kids and one with kids. Even when we have kids, we attempt to spend time with each other. 4. Money. What is a prudent amount of money to spend on vacation? Some spouses are too frugal–never willing to spend any money in the name of fun. Others are too flagrant–wasting money which hurts the family. Within your economic setting, pick a vacation that is right for you. Prioritize it so you are making sacrifices through the year because you know vacations are important. But don’t feel as though you have to spend a lot of money to have fun. 6. Work. Some people have the ability to ignore work while they are on vacation, others do not have such luxury. Boundaries need to be clearly set regarding how much work one or both spouses might do and when that will happen. Neither Jenny nor I can fully ignore our work while on vacation, but we can pick specific times to check in and do what needs to be done. Vacation is for breaking away, not simply working from another location. 7. Alcohol/Gambling. We don’t drink or gamble so this isn’t a discussion for us, but many couples end up fighting because one or both spouses drink too much or gamble too much on vacation. If you plan on engaging in these activities, limits must be set. Spending a vacation drunk is disrespectful to your spouse and your family. Creating financial problems while on vacation because of too much gambling will negate any positive emotions a vacation might create. It’s okay to have fun on vacation, but make sure everything is done with moderation. What would be an 8th issue you would add? Vacations are always tense & scary times for me. For years my husband simply left me in the hotel , in the ship cabin, where ever and took off to drink, gamble and flirt . He arranged his activities on the computer – excursions, fishing trips etc and told me his plans. It has been 10 years since the drinking and gambling but he still acts like a caged animal – pacing, unhappy, miserable. I hate vacations, it’s like it hi lights the breaks and distance between us. I have prayed to be loving, to have no root of bitterness to relax nd have joy but it’s always a very difficult time and triggers horrible painful memories , wounds and betrayals. Of course I can’t speak of any of these things to him. For couples who can talk openly- these are wonderful guidelines- how wonderful to be included in the choices and decisions ! Margie, thank you for the comments and I’m sorry for your experience. I think you are right–a vacation can reveal the breaks in the relationship.